Wanderjahr (noun): A lengthy period of time (usually a year) in which one takes a sabbatical from their home and career to travel the world in search of new points of view and experiences. You can follow my exploits around the world right here as I meander in search of animals that need help, and where there's new cultures, people, food and scenery. Join me! *Note: the most recent postings are on top-- scroll down to start at the beginning. Well, I did it again... I had to move the rest of my stuff out here so I flew back to Virginia in late January and loaded up my furniture with the help of Kenny Felmly and things in a 16' rental truck and drove back out to Concord CA. Since it was the middle of winter I went far south, to avoid any snows or storms that might slow me down. I didn't have time to sightsee like I did last trip. 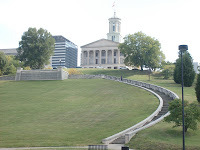 I immediately headed south down I-80, which goes all the way to Knoxville, then continued to Birmingham, Alabama (one more state I'd never been in! 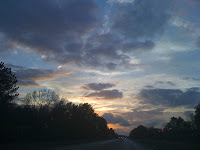 ), and by the second night I was sleeping in Jackson, Mississippi. One thing I couldn't help noticing in the Deep South: the roadkill. There were dead animals strewn along the highways in all the southern states, some of which looked weeks or even months old. One random stop in Texas I jumped out to take a photo of a speed limit sign (80mph) and looked down to see a skeleton of a deer at my feet. It appears the local counties don't bother to pick them up at all... pretty gross. 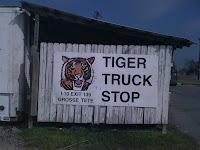 Along the way I planned one stop: outside of Baton Rouge, Louisiana, I had read about the "Tiger Truckstop", where the owners kept a large tiger in a cage outside their restaurant to attract business. This I had to see; I wanted to get some video to document it, and let the owners know what I thought of it. It was easy to find and right along my route. I parked and brought my little Flip video camera and my phone, which has a camera too. I had been warned that these people could be nasty. 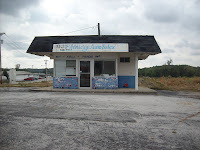 There were several buildings including a restaurant and the gas station/quick mart. Sure enough, there was a cage there in the middle of it all, not 100 yards from the highway (see videos below). 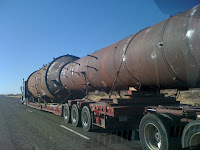 All the time big, rumbling 18-wheelers rumbled in & out. 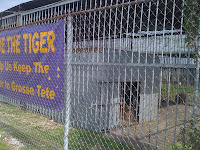 The cage itself was pretty crummy, and the tiger slept in a barren, dark little cinder-blocked 'house'. I took a lot of photos and some vids, which speak for themselves. I asked a lady at the counter if the owners were around, and she said no. 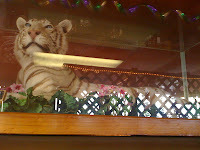 I asked her to give them this message: I WAS going to buy gas, eat at the restaurant, and purchase some snacks, but now I wasn't going to spend a penny there because they kept a tiger captive in an obviously inadequate and inappropriate place. She said "Everyone's entitled to their opinion" and seemed to not care at all what I thought, and saw nothing wrong with keeping a huge, wild animal in lifelong captivity at a truckstop. As I was leaving I snapped a few last photos with my phone camera, and the counter lady came out and said something to a big, fat, redneck-looking guy working there. He came up to me and said, "I don't know who you're with, Peta or whatever, but you've got to get out of here." I said sure, but as I walked to my truck I said "You guys lost a customer" and he said "Everyone's entitled to their opinion". Obviously they'd all been told to say that to anyone who decried the fact of their tiger's captivity. They didn't mind if you had another opinion-- but they didn't want you there to state it. He said some other things to me, but most was lost in the highway noise. 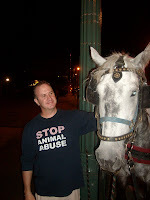 Somehow in my Penske rental truck I doubt I looked like a Peta protester, but they still acted paranoid, which is how people who abuse animals usually act to anyone with a camera asking questions about what they're doing. It must not be common there for people to actually state that they disliked the tiger's predicament; I wish more folks would speak up when they see something that looks wrong. It just might let greedy morons like those truckstop people see that perhaps they'd be better off not using animals to attract customers. Anyway, I also made a detour to Bryan/College Station, Texas, to see some old friends, the Ramseys. I didn't have much time, but they made sure I saw a bit of their town and took me to dinner. 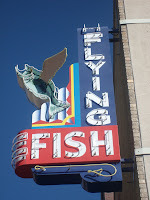 Ramsay took me on a tour of Texas A&M, then to dinner at a local seafood restaurant which was very good. I stayed the night at Randal's amazing house, which seems to be almost as full of treasures and interesting objects he's collected over the years as the Smithsonian. He showed me a fascinating assortment of arrowheads, rifles, animal skulls, and all sorts of antiques and other knick-knacks. There was too much to absorb in one visit; I'll have to go back just to see the rest! Then all too soon it was time to leave, but I didn't have far to go: just to Austin, to stay with some other friends, C.A. and Michael Duncan and their charming little daughter Ella. As busy as they were, they graciously put me up for the night, and although my visit was way too short, it was good to see them again. I had been sending Ella postcards from around the world, and now that she's four, she's as interested in animals as I am! 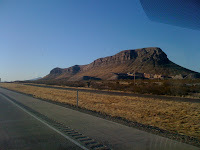 Then it was a loooooong drive across the rest of Texas the next day to El Paso, on the far west corner of the huge state. I think it took about 12 hours, and I arrived at night (as usual) in the border city, grabbed the first hotel I could find and zonked out. Then another long day of driving across Arizona took me right through Tucson, Phoenix, and all the way to L.A., where I stopped again at a Motel 8. Even the cheaper motels all seem to have wireless internet these days, which was nice, so I could keep up with my email and such. The last day I crossed California the long way, going right up the middle of the state. I had heard that it's mostly flat and boring, and they were right. Anyway I made it to Concord and my apartment before dark, and Bruce Felmly (yes, Kenny's brother!) helped me unload. The little apartment was so full of boxes I could hardly walk through it, but I (finally) had my own bed again, which I gratefully laid down on, and slept for 12 hours. Home at last! 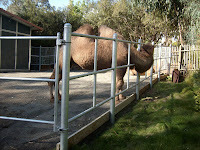 I spent all day roaming around checking out every animal, exhibit, cage and show I could find. If I had gone a year ago I probably wouldn't have noticed much wrong with them. But the last year has been an incredible period of learning: while preparing for my round-the-world trip I spent several months online researching zoos, sanctuaries and animal cruelty in general. 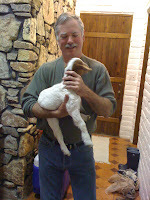 Then for 6 months I traveled the world checking out all kinds of animals in as many places as I could (all in this blog). That, and 14 years as a veterinary technician working in emergency clinics, had taught me to be a bit more observant than the average hot-dog-munching theme-park visitor. I filmed the pink flamingos and their mutilated wings (done to keep them from flying away.) Check out the photo: see how the wing on the left has been amputated? The other birds were all the same.) Worse, their pond was right next to a huge, loud ride booming and hissing every few minutes, causing them all to flap their wings agitatedly. Some life, huh? 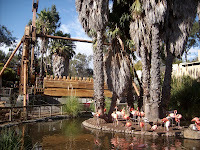 I took photos of the shy, nocturnal fennec foxes in their little cage situated right next to a tilt-a-whirl type ride, and the alligators stuck in a small pen within spitting distance of a huge rollercoaster. It was the same with the camels, lions, tigers, cougars, the list goes on. The lions had a pile of rocks to lie on and little else. The giraffe pen was small, bare, and ugly, but it was right in front of a pretty river which gave it a bigger look and distracted the eye from the actual habitat. It was amost an optical illusion, as you can see in the photo. 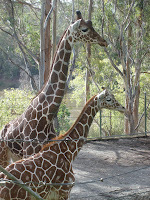 I asked a staff person in front of the giraffes, "Is this all they get?" She replied that they also get "walked around the park every day" when the cusomers werent' there. Now, I'm no expert on giraffes, but doesn't that sound unlikely to you, that someone "walks" them around the park? I asked her how they went about that, but she "didn't know, as she was only there during open hours". If you worked there, right in front of the tallest animals in the world, wouldn't you kind of wonder how they were walked like pets around your place of employment? Wouldn't you at least ask someone about it? Or even come early to see it once, if you had an iota of human curiosity? I was lied to twice again. 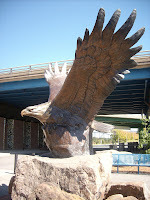 Once by a handler of a bald eagle, whose right wing was hanging down the whole time; I asked her about it and was told, "Oh, he's just tired". Look at the photo: does that look normal to you? Ever seen a "tired" bird hanging one wing (just one, mind you) down like that? And once again by an elephant handler who, when I asked about the bullhook he was holding just to see what he would say, answered, "Oh, they have skin three inches thick. They don't feel a thing." 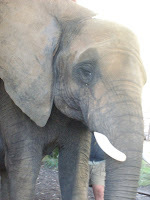 That was news to me, having studied elephants and read many times that their skin was up to one inch thick in certain areas but paper thin around the mouth, ears, and mucous membranes, a fact the handlers know all too well and use their bullhooks there for maximum effect. 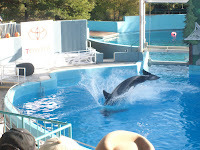 The 6 Flags staff seems to take advantage of the general ignorance of most visitors of animal husbandry and behavior, and help perpetuate myths, misbeliefs and outright lies. The way they did it so easily and efforlessly led me to believe they were well practiced in it, and surely are not going against any kind of company policies in doing so. That three employees would risk being fired in one day lying to a single visitor implies that others, perhaps most, do it quite frequently. Lesson: don't believe what they tell you. But mostly I just watched the elephants, a mix of African and Asian females in barren, ridiculously small, and ludicrously inadequate pens. The poor elephant patiently giving rides to visitors and their toddlers paced a little circuitous path over and over through what was a nice, green, shaded area. But right next to it, practically unnoticed by anyone, were the remaining elephants, languishing in a barren, boring little dirt pen. The were standing around looking bored and depressed, one leaning to take weight off one obviously painful leg. What looked small was in fact even smaller than it appeared; the area was divided into two smaller pens to separate the Africans from the Asians. I finished by watching the "Elephant Discovery" or "Encounter" or whatever it was called. 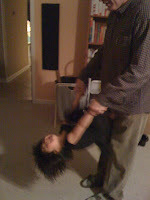 It was a short demonstration of some basic skills they had taught Tava, the matriarch of the little clan. She was absolutely beautiful, but when I really looked closely at her, her body language spoke loudly of hopeless resignation to her fate. 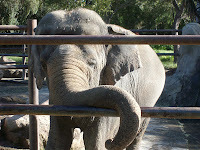 Her handler kept telling her "Trunk" upon which she would immediately raise her trunk up onto her head, undoubtedly to give her a happy, saluting kind of look. 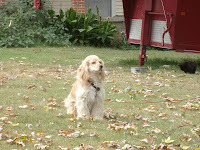 But check out the photo I took (attached) and see an expression undeniably sad. I wondered what kind of brutal training had made her fearful enough to keep raising her trunk so quickly for a puny human. 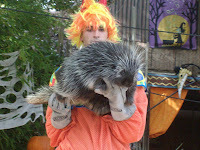 So that's 6 Flags today: very showy, all loud music, bright colors, fast rides, overpriced junk food and just plain junk for sale, and squeezed down among an d between the rides, crowds and theaters, live the animals. Enduring long days of noisy, vibrating machines and screaming riders, these wonderful wild creatures, who should be in quiet forests and deep jungles, getting brief glances from passersby who hurry by to catch the next roller coaster ride, or pause for a moment to point out some animal in a cage to their toddler, thereby reinforcing at an early age the belief that it's okay to keep them captive their entire lives simply for us to stare at for a brief moment, then move on to watch the magician's show around the corner. Driving through New Mexico after leaving Albuquerque, I was on the phone with Ramsay when I almost missed a sign that said something like "See the Wolves! 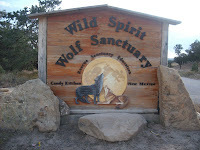 Wolf Sanctuary detour here". That sounded like something right up my alley, so I turned around and took the less-beaten path off interstate U.S. 40 and into unknown territory. 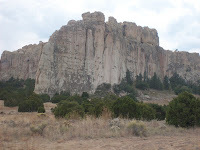 It turns out the sanctuary is in the middle of the Zuni indian reservation, a vast, wild and rugged area that was MUCH more interesting than the scenery along the highway. 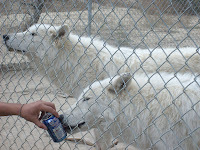 I would have arrived at Wild Spirit sanctuary past closing time, but for some reason they don't go by daylight savings time there, so I luckily had an hour left to get on the last tour of the day. It was fascinating. 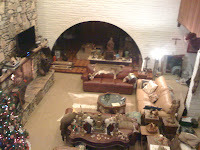 The little headquarters was cozy, the people friendly, and, of course, the stars of the show, the wolves themselves were brilliant. They didn't even have to do anything... just seeing them, being in their presence, was amazing. And when they all started howling, it was enough to give you chills. 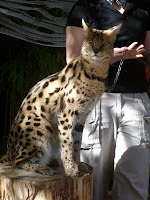 We were also lucky enough to be there when one extra-tame one was being walked, and got to pet him. To top it all off, we got a private tour into the fox's den by the director, Leyton Cougar, who had some fascinating stories to tell. After stopping for the night in Flagstaff, I headed north up into Utah to the Best Friends Society's animal sanctuary, where I was to do two days of volunteering to get an idea of what went on there. (I've learned that the best way to get behind the scenes of an organization is to actually work there, so just taking a tour as a visitor wasn't enough). Leaving Memphis and the green Tennessee hills took me away from everything familiar that I'd driven through my whole life. I've traveled around, but never driven from my house to the kind of flat, dry places I was seeing now. While in Tennessee I could still imagine that I was still sort of in the East. 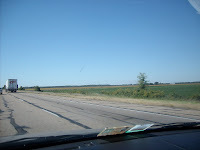 But when entering Arkansas, there was no denying it: I was in the boonies. On a map it's almost half-way across the country. And I have to admit it wasn't as boring as I thought it would be. Besides the excitement of finally fulfilling my dream of a cross-country drive, the landscape was so different from what I was used to it made it kind of exciting. 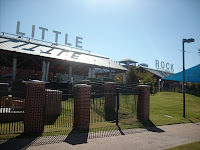 And I was looking forward to stopping in Little Rock, a town I knew absolutely nothing about (which made it interesting) except that the Clintons were from there, and that Marilyn Monroe sang a song about it in a movie. It turned out to be a pretty nice little city, small enough to zip in & out of, and big enough to have some cool stuff to see. 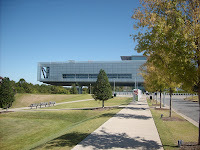 It was a beautiful day, and I was hoping to have time to check out the Clinton Presidential Library, which I'd heard was really something, but didn't know where it was. 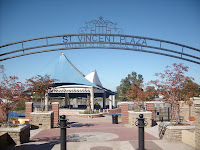 Finding the way downtown, I stopped on the main drag (I forget the name of it) near the Missouri River, where places like St. Vincent Plaza and the "Flying Fish" restaurant were. The Plaza was a little park on the river, and the "Fish" turned out to be a great casual place to stop by for a plate of clams & fries. 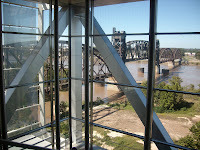 But looking down the street, I spotted the unmistakeable silhouette of the Clinton Library, hanging over the river just a few blocks away. 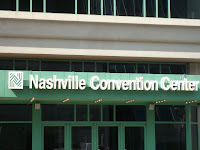 So in I went, paying my entrance fee and soaking up all the pro- Clinton publicity one could hope for in one building. 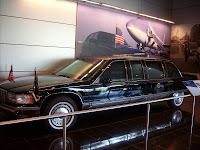 Seriously, it was a pretty good museum of the political events of the '90's, and even had perfect replicas of the Oval Office and the Cabinet Room, as well as one of his presidential limos, with bullet-proof glass windows so thick you could barely see through it. It may well have been the one I saw pass by on Pennsylvania Avenue after his second inauguration. Hillary was waving, barely discernible through that heavy window. After 9/11, I can only imagine George Bush's limo windows must now be able to stop a tank. I paused to check out some pups for sale on a street corner, then I was on my way to Oklahoma, which arrived surprisingly quickly. I don't know what tapes or radio stations I was listening to in Arkansas, but they must have been good because I barely remember driving through the state. Before I knew it it was dark and I was in Oklahoma city for the night. Finding a Best Western, I settled in for an evening of listening to TV while sending emails. 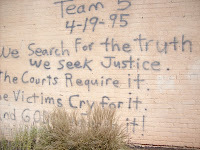 The next day I went to see the Memorial, officially known as the National Memorial & Museum, build where the Alfred Murrah federal building was bombed in 1995. It's a must-see for anyone even passing through, and I quickly found my way there, in the heart of the city. They did a great job, bulding a park where the building used to be, with ponds, trees, and those iconic chairs, one for each victim, in a grassy field. 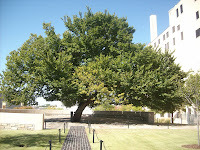 One special item was the "Survivor Tree", a grand old American elm that actually survived the blast, and still bears the blackened scars of that infamous day. I also had to stop at the Memorial Fence and read some of the touching messages and see the many gifts, patches, crosses, flags, wreaths and other items attached to it. I had a sudden urge to add to it. Searching my car, I found nothing suitable. 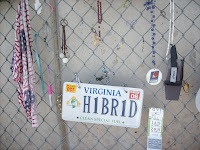 Then I remembered that soon I'd have to get new license plates in California, so I quickly unbolted my "H1BR1D" plate and clipped it onto the wall, showing that someone driving from Virginia had stopped by to visit. I also added my luggage tag (Dulles to Zurich) from an old trip. It's nice to know that they'll be added to the museum's collection of thousands of other items left on the fence. 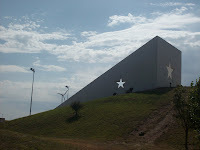 There was much, much more to the memorial, not even including the museum, but space prohibits including it all. 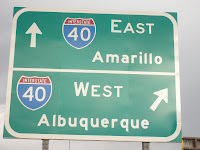 And time was pressing, so I headed once again westward, this time making my way across the panhandle of Texas to New Mexico. Now I was not only half way across, but truly in the West. The panhandle is the "chimney" top portion of the state, and looks rather small compared to the rest, so I figured it would pass quickly by. But, unlike Arkansas, it seemed to take a very long time, in spite of that wonderful 75 mph speed limit (which meant I could drive 84!) 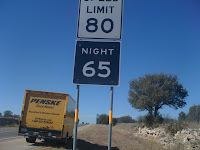 Forunately I had my new cell phone with me, and remembering some old friends who live in Texas, the Ramsey twins, I spent several hours catching up with them while driving the endless miles. One of them, Ramsay (yes, that's his name), told me to look out for the big balloon festival in Albuquerque that might be coming up soon. I doubted I'd hit the city the same weekend, but appreciated the info. 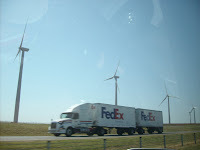 About the only interesting things I saw in the whole panhandle were lots of colossal windmills, and possibly the best highway rest stop in the country. 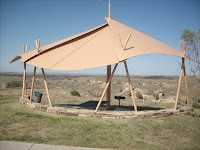 It was a uniquely wedge-shaped building with gardens, a good information booth, and even a tiny museum-quality display on windmills. Some Texans must complain about the money spent on a place that mostly "out-of-staters" will use, but we travelers certainly appreciated it. 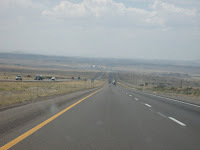 It was dark by the time I arrived in Albuquerque, and I had some trouble finding a hotel, even though I could see them from the highway. Once I exited, there were no signs pointing the way, and I quickly became disoriented in the dark, unknown city. This was an experience I repeated several times, and it seems that the cities might want to help out travelers and give them a bit of direction on where to go to places like that. But I finally found a Motel 8 which even had internet access, so I had my usual leftovers from lunch, checked my email, and hit the sack. The next morning I had a tough choice: I could push on, or stay a day and see the International Balloon Fiesta, which I found out from the hotel clerk was starting the very next day! It was supposed to be an awesome sight, hundreds of giant hot-air balloons rising in waves at sunrise and again at sunset. I opted to drive to the fairgrounds and maybe decide then. But back and forth driving revealed only rows of RV's and campers on the fairgrounds. I guessed the balloonists wouldn't be arriving until early the next morning. Whatever the case, I found the urge to move on stronger than my desire to see all those balloons, so westward once again I went. Next: Flagstaff, Best Friends Sanctuary, Salt Lake and Reno.... and wolves. See you there! I'm back in San Francisco after driving across the country for the past 10 days. 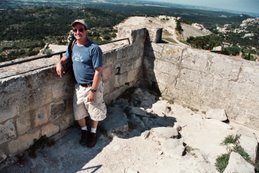 I didn't go overboard and make marathon 12-hour drives; instead I stopped in cities and places I wanted to see, and occasionally made brief side trips to explore a bit. 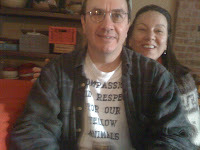 It all started when I decided to take Dr. Bachman's offer of a job in his shelter/clinic near San Francisco. The Contra Costa animal shelter has two separate clinics in it, one public and one for the shelter animals, so th ere's lots to do there! But everything I own was in Virginia. I decided not to move everything all at once, which would mean having to tow my car behind a moving van. Instead, having gotten quite used to living out of a suitcase for the past year, I filled my car with the basic necessities I might need for a few months and took off. I didn't even have a place in San Fran to live yet, but knew I could rent a room-- people are always renting out. I can fly back later and get the rest when I decide where to settle down. So off I went on a bright September morning. Route 81 goes all the way to Knoxville, Tennessee, and I made the drive easily, listening in on the different local radio stations, which included everything from cou ntry music to NPR (public radio), which was broadcast in a surprising number of remote places. 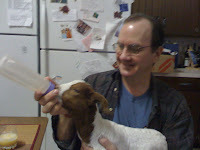 And that's where I soon was, in remote southern Virginia, which is a world away from the suburbs of Washington D.C. where I grew up. 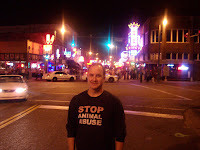 It was late by the time I reached Knoxville; there was nothing I wanted to see there anyway, having visited it a while back while volunteering for a RAVS (rural area veterinary service) weekend. I found a hotel off the highway and, still bleary with road daze, found my room and collapsed. But I was excited about the days to come. This was about as far west as I had ever driven. I've always wanted to drive across America; I've even had vivid dreams about leaving and just heading west as far as I could go. It was finally going to become reality. I must admit I was a bit concerned that it would turn out to be a huge disappointment, especially after having just returned from a round-the-world tour. But I needn't have worried. 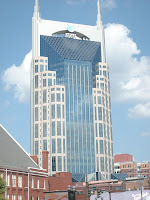 The next day I made Nashville by noon, and found the downtown historic center, the first place I always look for, having gotten into the habit in the old cities of Europe. I had been told that there wasn't much there. It seemed like a nice enough town, and might have been interesting seeing the main street in the evening when the bars and restaurants were in full swing, but I was more interested in Memphis which was still a half-day's drive away, so after a quick drive around town I opted not to stop for lunch, but instead push on. 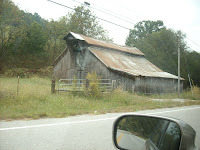 Along the way on a whim I got off the highway and took a parallel road just to see a bit of rural Tennessee. 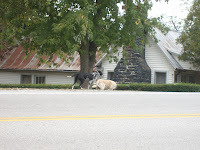 I stopped to check on some dogs roaming in the street, but they quickly took off. It was there I noticed a beautiful spaniel in the yard next door, whose owner I had a nice chat with after being unable to resist petting the dog. 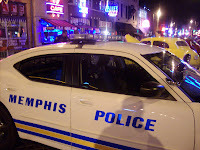 I got to Memphis by evening, and quickly got a hotel and, knowing next to nothing about the city, asked the clerk where to go. 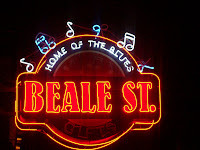 He gave me directions and I soon found Beale Street, the neon-lit equivalent of the French Quarter of New Orleans. It was touristy, tacky, completely gaudy, and I loved it.... at least for a few hours. The tourist district is ony about 3 blocks, but there's lots crammed into that little area. There was blues music blaring from every bar, beer stands which you could walk away with a drink from, and curio shops selling everything Elvis that the most die-hard fan could hope for. 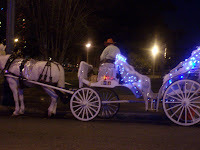 Even the horse-drawn carriages had neon lights. I never made it to Graceland, but after hearing about it later I probably should have stopped by. 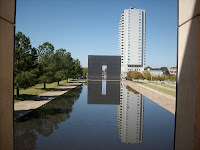 Well, I had to make Oklahoma City the next day, so I'll just have to go back there some day. On a Rick Steves tour of France. Hi! I'm a veterinary technician now residing in Lafayette (near San Francisco) California. My wife Sanda & I are both animal protectionists, and have 3 cats and help out 2 raccoon families that come to visit each night. 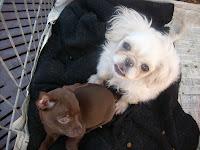 You can read about how Sanda and I met in this blog. NOTE: the posts are the most current first, so to start from the beginning you'll need to scroll down to the beginning. Enjoy and thanks for visiting! Once upon a time, for a fortunate few, travel was the worldliest form of education and a vital part of life. From the late 17th century until the end of the 18th century, privileged young women and men made ready for adulthood by embarking on the Grand Tour, an extended journey through Western Europe that was a crucial rite of passage for the European and American elite. They learned fencing and French in Paris, riding and music in Vienna, and invariably they immersed themselves in art, politics, history, and classical literature in the great city-states of the Italian peninsula, before Italy itself existed . . . Venice, Florence, Naples, and Rome, the Eternal City. During these extended voyages, which often lasted years and were considered so central to a young person’s upbringing that they sometimes replaced a college degree, travelers not only became intimately acquainted with these fabled lands but also experienced firsthand the native ways of life so stimulatingly different from their own. In an age of horse-drawn carriages and sailing ships, getting there was itself part of the adventure. For all the cosseting that aristocratic ramblers might have received in the capital cities, they could never escape the inherent adventure of the journey. Crossing the storm-tossed English Channel and the ice wildernesses of the Alpine passes, surviving the bandit-infested highways of Campania and the flea-ridden inns of the Black Forest, travelers faced unfamiliar risks and uncertainties, met unlooked-for companions, and were constantly aware of the serpentine passage of time. In the process, they learned about life in one of the best laboratories of human experience: the road. The Grand Tour was an education in the root sense of the word, from the Latin e + ducare, “to lead forth”­—to take people out of themselves, thereby widening their horizons, making them at once more resilient and worldlywise. 1. to ramble without a definite purpose or objective; roam, rove, or stray: to wander over the earth. 2. to go aimlessly, indirectly, or casually; meander: The river wanders among the rocks. P.S. I'll try not to ramble in my writings!